This item comes courtesy of the folks of HUH: Hipsters Uniting Hipsters. 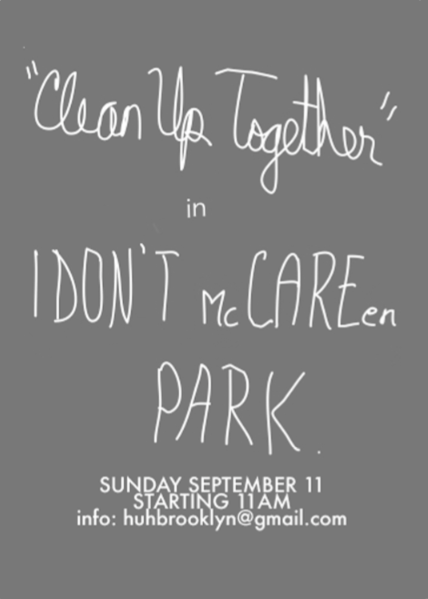 The premise is easy enough: starting at 11:00 a.m. this upcoming Sunday they will be hosting a clean-up of McCarren Park (to which they refer to as being “The World’s Largest Toilet”). Yours truly thinks this might be a bit of a stretch— but let’s face facts: it is in dire need of some TLC. Check it out! September 11, 2011 starting at 11:00 a.m.